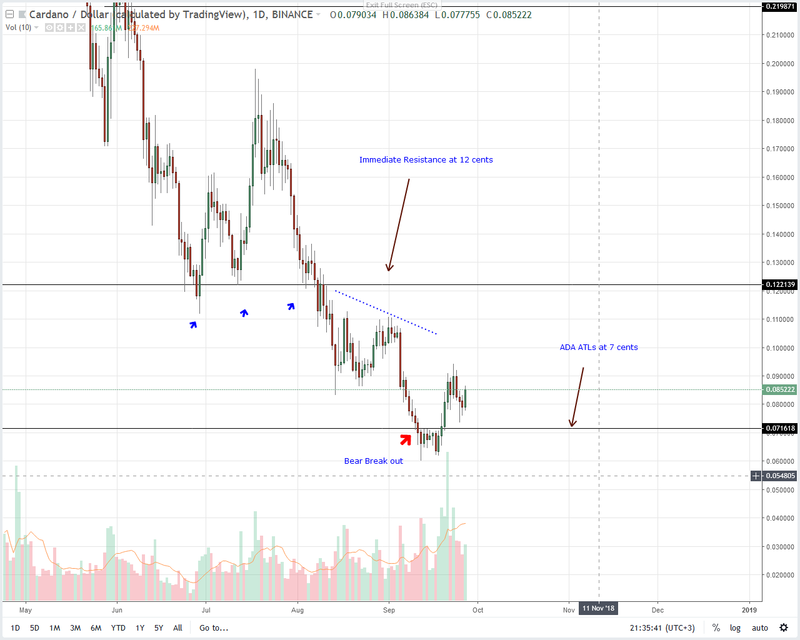 Altcoin prices are on the rise and with Bitcoin Cash spearheading the recovery, there is a technical undervaluation in EOS, Litecoin, Stellar Lumens and Tron. Going forward, we retain a bullish recovery. As long as prices are trading above this week’s key Fibonacci retracement levels between 38.2 percent and 50 percent, this undervaluation shall be corrected in due course. 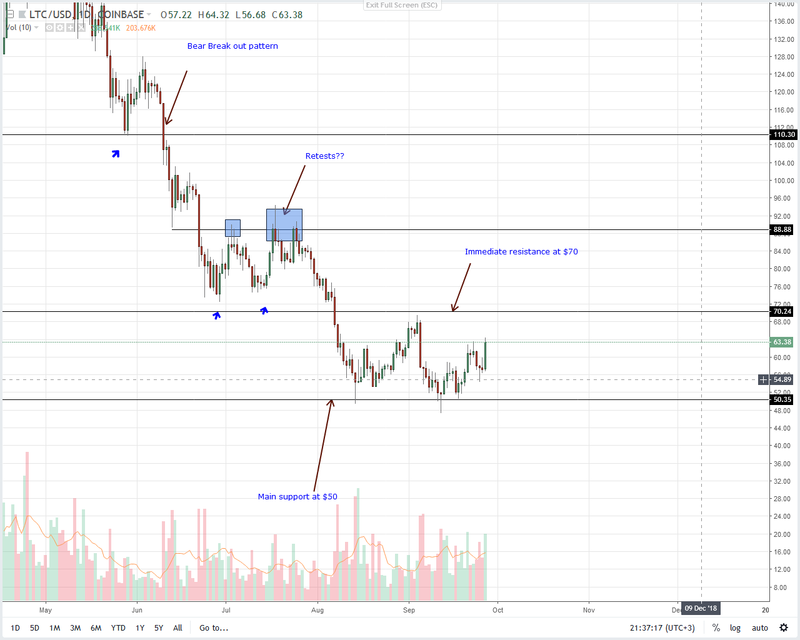 In the daily chart, EOS prices are edging higher. Even if it is bound within tight ranges, the fact that we have series of higher highs bouncing off important Fibonacci levels points to a background rejection of lower lows. Today, we expect buyers to add on yesterday’s gains. Moving forward, risk off traders can begin buying in lower time frames now that prices are inching higher. Depending on your trading style and the fact that prices are still oscillating within last week’s high low, it is ideal for conservative, risk-on traders to buy only once prices are above $7 as per our previous iterations. RaspiBlitz, which depends on Stadicus’s RaspiBolt, now offer support for Litecoin Lightning Network. With RaspiBlitz, users can–with the use of Lightning Labs implementation, LND–“spin up” their own Lightning Network node. However, they ought to have their own RaspberryPi module. 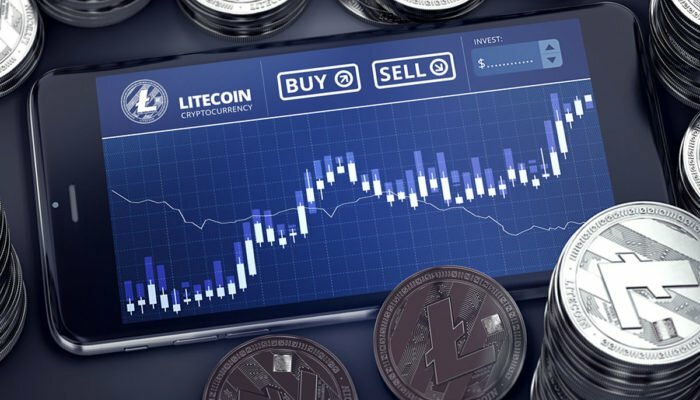 Litecoin bulls are back following yesterday’s six percent additions. Even though prices are still trading inside last week’s high low confinement, momentum is building and prices are up six percent in the last day. All things constant, we retain our last Litecoin trade plan recommending buys thanks to yesterday’s propulsion past $60. As it is, $60 is last week’s highs and a minor bull trigger ushering small position buys eyeing at $70 or the upper limits at $90. CoinBase is planning to rapidly add digital assets on their platform. Coins or tokens that stand to benefit are those that adheres to CoinBase’s KYC and AML requirements and are classified as utilities. Stellar platform though pre-mined is a utility and embrace decentralization. It’s also one of the five coins CoinBase were exploring earlier on. As a liquid coin in the top 5, the latest announcement could boost odds of a listing and by extension price. It’s an effort versus result scenario in the daily chart meaning Sep 23 bulls are in control. 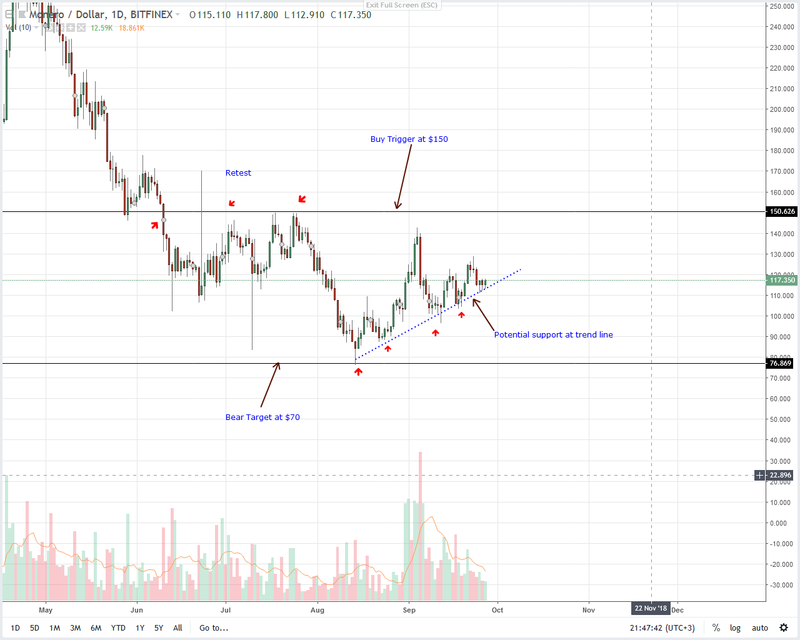 From yesterday’s XLM trade plan, our trading depended on the velocity of sell pressure rejection lifting of prices above 25 cents—the break out level. Now that there is a strong, market defining surge above that level, we recommend risk-off traders to buy at spot even if the spike didn’t clear 30 cents. Risk-averse traders on the other hand should wait for solid moves above last week’s high before taking buy positions with targets at 50 cents. Project Atlas, is an ambitious project. 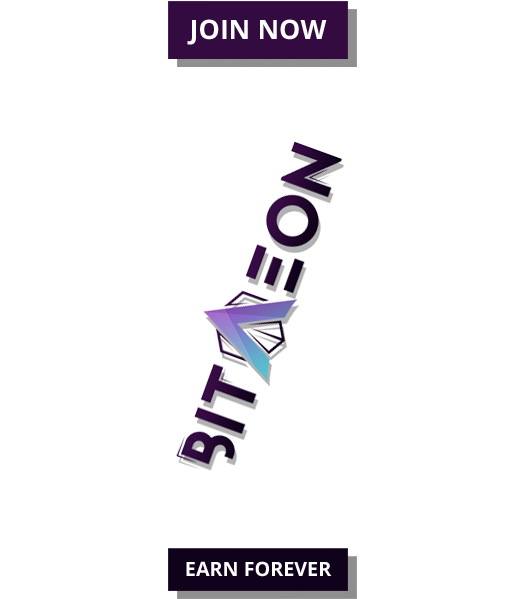 It will see the integration of Tron and BitTorrent creating a wholesome, fast and secure content sharing and distribution system. 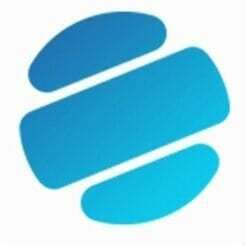 TRX will be used for settlement. For implementation, Project Atlas integration will come with backward compatible extensions protocols with no mining. According to Justin Sun, this will empower content distributors. Tron will hold a presentation today to elaborate more on the project. Price are stable and finding support after retracing 50 percent from last week’s high. Even at the back of high trading volumes, it’s imperative that prices rally past 2.7 cents-3 cents zone. Not only will that be a trade confirmation but it will entail a break off from the last two months consolidation. Because of this, traders stand a chance of turning in a profit by buying at spot rates. 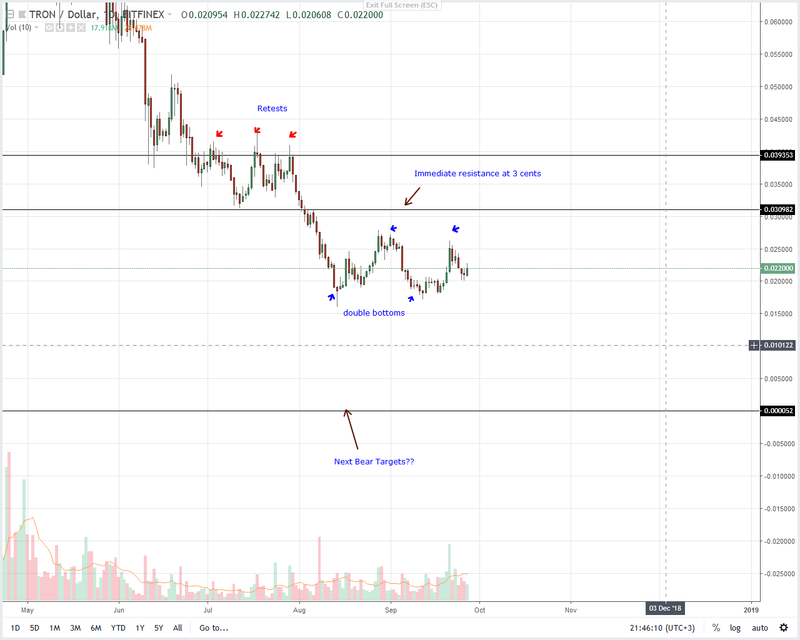 First targets are at 3 cents and later 4 cents in sync with prior Tron price prediction. Safe stops should be at Sep 17 highs or 2 cents. 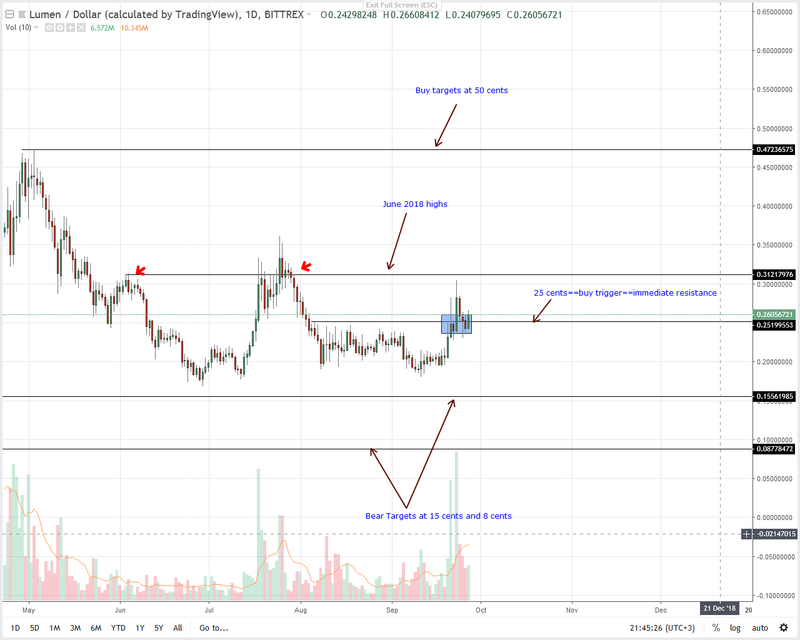 No doubt, the last two months has been bullish for Monero. Notice that aside from the clear higher highs with support trend line buoying bulls, Monero prices are up 30 percent in the last month. This is positive and hints of a slowing bear momentum relieving bulls. 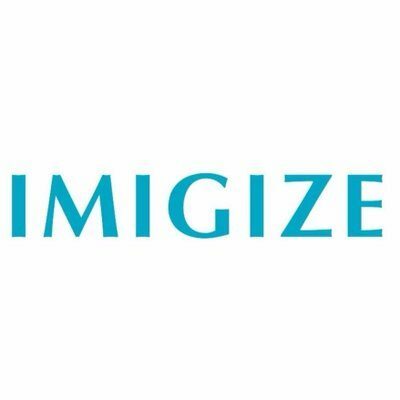 To sync with our last price prediction, we retain a bullish outlook. That’s as long as bulls are trading above the support trend line or at $100. Today, that the overall sentiment is bullish, we suggest taking long positions at spot with stops at $100. Any contrarian move that will see Monero prices melting below $100 nullifies this forecast.